Alongside Martin Freeman, Maxine Peake, Morwenna Banks, and Matt Berry, Mackie appeared as a front of house girl in the 2013 music comedy Svengali. In 2014, Mackie played Anne-Marie Frasier in Doctors and the young computer genius Mia in Crystal Springs at the Park Theatre in London. She could also be seen in the political satire Obama-ology at the Finborough Theatre in west London, playing Cece and Caits, two young women finding their voice. In 2015, she performed in the National Theatre's West End production of The Curious Incident of the Dog in the Night Time. In the same year Mackie appeared in the short film Date Aid by Bond, a satirical public service announcement. Mackie has also worked as an acting tutor for Troupers, a company that teaches theatre skills to children and young people. 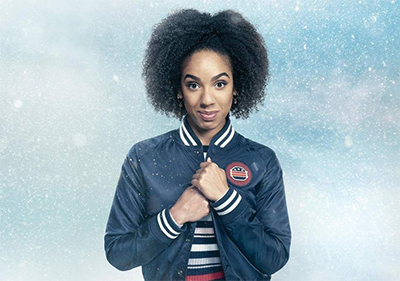 On 23 April 2016, it was announced that Mackie would be playing Bill Potts, the companion of The Doctor in the British television series Doctor Who. It was also announced in March 2017 that Bill would be the first openly gay main companion in the series. After production on Series 10 of Doctor Who had wrapped, Mackie joined a production of Harold Pinter's The Birthday Party as Lulu. The production - costarring Stephen Mangan, Toby Jones, and Zoë Wanamaker - opened in January 2018 at London's Harold Pinter Theatre. Mackie will be appearing Saturday and Sunday only.